Now it’s easy to add professional monitoring and broadcast quality recording to any SDI or HDMI camera. With a bright 7 inch monitor that’s larger than the built in screen on most cameras, Video Assist 4K makes it easier to frame your shots and get absolutely perfect focus. The dual built in high speed UHS-II recorders use commonly available SD cards to record HD and Ultra HD video as professional 10-bit 4:2:2 ProRes or DNxHD files. Unlike DSLRs, which record heavily compressed files that are hard to use with video software, Video Assist records professional, 10 bit broadcast quality files such as ProRes and DNxHR that are compatible with all leading video software so you can start editing immediately, without time wasting file conversions. The Blackmagic Design Video Assist 4K means it’s now simple to add professional monitoring and recording to your camera with an Ultra HD 7” high resolution 1920 x 1200 monitor – enabling the user to see a full 16:9 image without the status bar covering the picture. Compatible with any modern camera to ensure perfect focus and framing, this 4K model uses two high speed UHS-II SD card recorders to record 1080 HD as well as Ultra HD up to 2160p30 on low cost, readily available SD cards. Whether it’s a wedding, an indie film, or a television advert, it’s crucial to ensure your images are perfectly sharp and captured at the highest possible quality, no matter what type of camera you use. 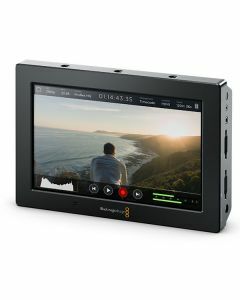 The Blackmagic Video Assist 4K is compatible with everything from DSLR’s to older tape based camcorders and even the latest digital film cameras. The Blackmagic Design Video Assist will deliver professional images with the quality used by major motion pictures and keep every single shot in focus. Get unbelievable colour, clarity and detail: Video Assist records at the highest 10-bit 4:2:2 quality. Files are recorded on fast, inexpensive and readily available SD cards and saved as standard ProRes HQ or DNxHD files - start editing immediately without having to convert the files. Recording is automatically triggered on the Video Assist using your video camera’s start/stop button, meaning the user can remain focused on getting the shot without having to worry about operating additional gear. The Blackmagic Video Assist uses a brilliant 7” 1920 x 1200 display so you won’t have to carry extra on set monitors and scopes. It can be mounted on cameras as a large monitor for the crew, handed to the cinematographer for composing a shot, or set in front of the director to review each take. The screen has a wide 135º viewing angle, making it easy to see, even when several crew members are watching. In addition, the image auto rotates. No matter which way you set it up, your cables will always plug into the side you need them to. You can view any SD or HD format and, since it includes a 6G-SDI connection, you can even monitor Ultra HD.